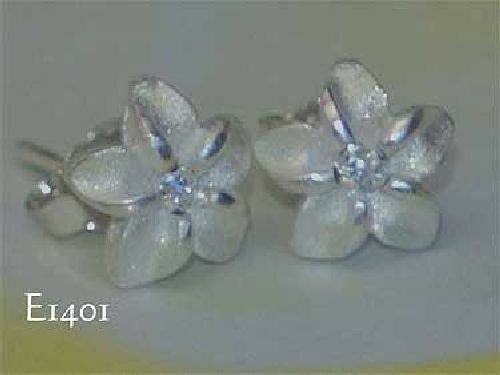 Sterling silver Hawaiian Plumeria (frangipani) stud earrings with frosted finish and features polished highlights with central sparkling eyes of clear cubic zirconia. Post back with spring butterfly clips for pierced ears. Matching pendants also available. Beautiful Hawaiian jewelry, ideal for weddings and special occasions - or just everyday! Measurements: Each flower 6mm diameter. 0.60 grams weight per pair. Also available in sizes from 8mm to 15mm diameter.